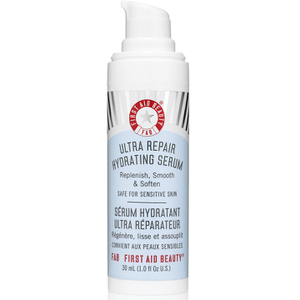 Catering for all skin types, including sensitive, the First Aid Beauty Ultra Repair® Hydrating Serum replenishes, soothes and calms your complexion, revealing rebalanced skin with improved suppleness. 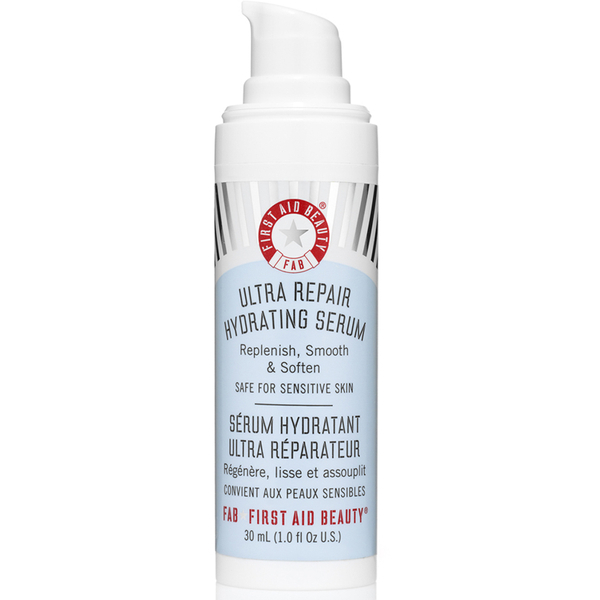 Fortified with Hyaluronic Acid, the water-based gel penetrates deeply to lock in moisture and quench parched skin, whilst Aloe Leaf Juice and Colloidal Oatmeal work to eliminate irritation for long-lasting comfort. A cocktail of Collagen and anti-ageing Peptides helps to firm, plump and minimise the appearance of fine lines and wrinkles, leaving your complexion refreshed, younger-looking and revitalised. 94.1% of panellists reported an improvement in areas prone to dryness. 94.1% of panellists reported that their skin appeared smoother. 94.1% of panellists reported an improvement in the overall appearance of their skin. Use daily in the AM and/or PM. Apply 1-2 pumps of product to a clean, dry face. Wait until completely absorbed before applying moisturiser.